Purchased this at a thrift store.Tried to put it back three times, and each time had a very strong urge to pick it back up. Of course I finally purchased it. I have looked probably in all the wrong places, until I found your website. I appreciate the knowledge and expertise you display.And hope that you can be of assistance to me.The beautiful bowl may not be worth a dime. I'm not looking because of possible value, but a desire to uncover the mystery of when, where, and whom, may have made such a beautiful bowl. I had to take a picture on my mobile phone, and will get better ones if needed.There are two, one showing an overall side view, and the second showing the bottom of the bowl. The seal, mark,or whatever it actually is,doesn't have a crystal clear image.But I would be more than happy to get a better one to you. 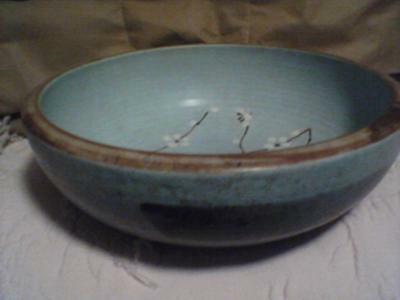 Hi, the bowl decoration gives the distinct impression of being Japanese. 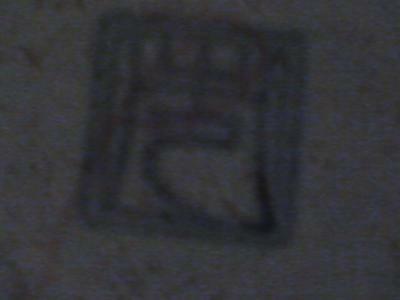 The mark could be both, either Chinese of Japanese, but the latter is more likely, due to the character style. Return to Ask a Question or Contribute - archived 2012.